Deposit money into your company’s account via Swedbank’s ATMs across Lithuania. Improper fulfilment of your financial obligations increases your funding costs and can negatively affect your credit history; moreover, if the agreement is terminated due to a material violation on your side, forced debt recovery may be launched and you may lose your ownership right to the pledged property. There is an interest-free period of up to 31 days (from the purchase until the payment date) when paying by card. Interest is calculated from the moment you make a credit transfer or withdraw cash from your credit card account. Several cards can be ordered and linked to a single account for employees. Allow or disable various card transactions like payments, withdrawals, deposits, ATM payments can user having full profile in Internet Bank. Contactless functionality can be disabled or enabled by company’s Internet Bank user having profile „All transactions“ to card account. In Mobile Bank rights and limits can be managed by company’s legal representative having the sole right of representation according to the commercial register. Contactless payments will also work abroad, limits can differ from country to country. The agreement must be signed by legal representative and after that the card could picked up in branch by card holder. Business Credit Card. Conditions and fees. Applies to cards issued from 01-10-2016. 1 The fee is deducted from the client’s bank account at the time of card activation. 2 Monthly card administration fee is deducted from the client’s bank account for the current month on the 15th day of every month after the activation of a new or renewed card. 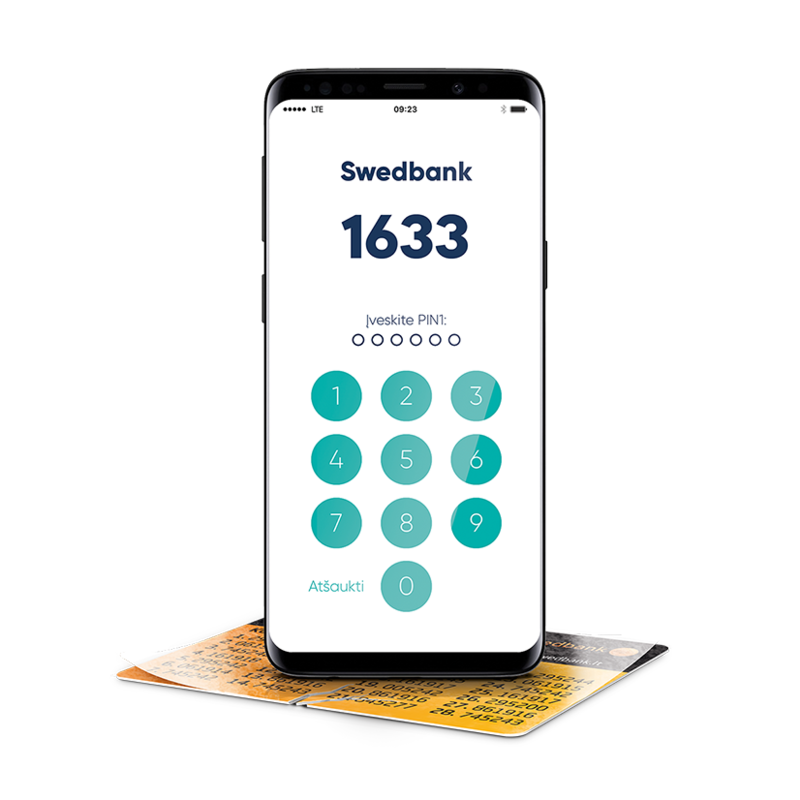 3 If a card which could be used for cash depositing transactions only is granted the right to perform other transactions in the Swedbank internet bank for corporate customers or in the bank’s office as well (for instance, cash withdrawal, payment for goods and services, etc. ), in such case, the card will be subject to a monthly card administration fee. 4 The fee is charged only to cards issued from 01-07-2017. 5 For more details about partners that provide cash withdrawal services for cards issued by Swedbank, AB visit website www.swedbank.lt. 7 At the client’s request, standard daily limits of transaction and periodicity can be changed. 8 Upon the Bank’s approval, a bigger than standard limit for depositing cash at ATMs of Swedbank, AB may be set, which is valid until the date of expiry of the card. 1 All other issued cards linked to the same credit limit account shall have the same expiry date as the first issued card. For this reason, if a new card is issued at a later date, its period of validity will be less than 3 years. 2 The fee is deducted from the client’s bank account at the time of card activation. 3 Monthly card administration fee is deducted from the client’s bank account for the current month on the 15th day of every month after the activation of a new or renewed card. 4 For more details about partners that provide cash withdrawal services for cards issued by Swedbank, AB visit website www.swedbank.lt. 5 It is a period during which no interest rate is paid for unused funds of the credit which were paid for purchases and services by paying by card. This period is set from the moment the funds of the credit are debited to the nearest date of credit repayment. 6 To be set individually. 8 At the client’s request, standard daily limits of transaction and periodicity can be changed. Transactions in the credit limit account without using a card are subject to the limits of transactions specified in the Agreement on the Provision of Electronic Services. 9 Upon the Bank’s approval, a bigger than standard limit for depositing cash at ATMs of Swedbank, AB may be set, which is valid until the date of expiry of the card. Fees are valid from 20-09-2017. 7 For one visit per person in the airport’s lounge. 10 More details about terms and conditions of insurance services are provided on the bank’s website. 1 At the client’s request, total limits for daily transactions can be modified. Card purchases have an interest free period of up to 31 days Calculation will start from the time of purchase until the 1st date of the following month. If you suspect you have lost your card, you can temporarily disable it via the Internet Bank or through our mobile app (Android only). You have 10 days to reopen your card if you should find it or it will be automatically closed. If a bank card is stolen, it must be closed immediately. You could do it by yourself in Internet Bank in case You are Internet Bank user and have access rights to card’s servicing account. Or you could do it by calling our business client consultation center on by short number 1633 or at any time (8 5) 268 4820. From abroad you can call by number +370 5 268 4422 or +370 5 268 4820. If you would like to secure PIN then you can change it in Swedbank ATMs in Lithuania. you discover that your account statement includes transactions for which you did not aware of or not reach an agreement with the merchant or service provider. You should apply to the bank no later than within 60 days after transaction date by filling application. Note! If You will apply later Bank has a right to reject application and not to initiate investigation. More information: General rules of claims investigation in Swedbank.